Despite not having any professional sports franchises in the state, there are still a few options to legally bet on sports in Iowa. This guide was created to help you find a sportsbook that you can place those bets with safely, and legally. Here we will provide you with all of the legal information regarding the sports betting market in IA. Once you understand the details behind the legalities on a state level as well as the US federal regulations, your next step is understanding what to expect out of these legal sports gambling providers. In the time that this industry has functioned legally it has created an international market of competition between the various sportsbooks that accept Iowa residents. That has fueled an optimal market for the customer to shop around for who offers the best sports betting incentives. The same can be said for all forms of Iowa online gambling entertainment. This guide will help you in that respect as well. The online gambling community is one that fights stereotypes created out of misinformation. It is actually not illegal to place bets online in any capacity from within the United States or more specifically, from Iowa. The only states to place such a condemnation on the actual act of placing a bet online are the states of Washington and Connecticut, and they don’t even have the technology available to surveil their citizens for such a crime. Here are the facts. There are two main federal gambling laws in the United States that have had an impact on sports gambling. Those are the Professional and Amateur Sports Protection Act (PASPA) and the Federal Wire Act of 1961. PASPA was repealed in May of 2018. Before its repeal, it prohibited the expansion of sportsbook gambling throughout the US by restricting it to only 4 specific states, including Nevada, Oregon, Montana, and Delaware. The Federal Wire Act, despite being written before the internet was even created, was interpreted by the Department of Justice to apply to US based online sports betting, strictly prohibiting the operation of any online sportsbooks within the United States. These laws aren’t written to make placing the bets illegal, they were written to make owning the businesses that support those bets illegal. So, unless you live in either Washington State or Connecticut, there are no federal or state laws that can restrict you from placing sports bets from Iowa at legally licensed and regulated offshore sportsbooks that are physically located outside of US federal jurisdiction. For more than 20 years now we have been researching and vetting the top USA online sportsbooks in the industry to come up with a solid list of top-flight providers. Our team of industry insiders has teamed up with technical specialists to put these sites through a vetting process that looks at both the legal credentials that they possess and the digital safety measures that they employ to keep their customers safe from potentially malicious online attacks. All of the brands that are included in this guide have meet our stringent standards and provide a legal, secure and high-quality betting environment. Is Iowa Known For Any Specific Sports? Back in the late 2000’s when Mixed Martial Arts had just broken into the mainstream professional sports spotlight, there was one dominant fight team that will never be forgotten in the history books of MMA. Miletich Fighting Systems was based on Bettendorf, Iowa and built some of the best fighters to ever have fought in the sport. They were known for their brutal training practices and winning mentality having multiple UFC world champions. 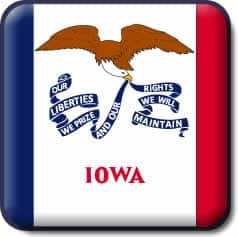 Being from Iowa you can find some sporting pride in the fighters your home state created and if you are the type that likes to add some excitement when you watch the fights, you can still bet on some of their fighters today. Robbie Lawler, former welterweight champion, and fighter of the year winner comes from that hallowed ground of Miletich Fighting Systems and is still active in the UFC. The selection of sports covered in these sportsbooks are the primary servicishat are provided and the international market for competition keeps each of them on their toes to offer more and more as time goes on. In addition to what might be considered as the obvious sports organizations like the NBA, NFL, MLB, and the NHL you can also find a whole menu of sports that are popular all over the world. Sports such as cricket and rugby that are played at a prominent level in Australia, or soccer (better known in the rest of the world as Futbol) which is known as the world’s most popular sport outside of the US. As you look through the sportsbooks you might be surprised to find things like winter biathlons in Austria, or competitive multiplayer online arena video games like League of Legends. Yes, you can place bets on video game competitions. There are even some really fun prop bets like what lady GaGa might wear at a particular celebrity event or how long it will take Trump to get impeached. You’ll find lines on golf, tennis, boxing, motor sports, water sports, racing, darts, and more. Are There Bonuse Offers At Online Sportsbooks? The bonuses that are offered by sportsbooks are their primary methods of incentivizing potential customers to sign up with them versus their competition in the international market. You should expect multiple bonuses on offer but the main one that you shouldn’t go without is the welcome match bonus. It has become an industry standard for all the sportsbooks that are worth your time. It’s a bonus that matches a certain percentage of your first deposit or first multiple deposits and offers you extra funds based on those amounts. It’s not uncommon for sportsbooks to advertise 50% match bonus up to $1000 in extra funds. In this offer, the sportsbook would match 50% of your deposit up to a maximum amount of $1000. With this bonus, if you deposit $100, you will get $150. Nothing beats free money. The mobile sports betting community has been ever growing recently with newer and newer technology. Each of the sportsbooks that we recommend in this guide is fully mobile optimized and provide their sportsbooks with ease of access for all mobile devices through a web-based platform. From your phone, you will be able to access all your account details and view all the latest money lines on all the sports that you follow. You won’t need to download any large capacity apps or get a specific device to use them, they are all fully functional through your device’s browser. The live-betting options seem to go pretty naturally with the mobile betting options. Each of the sportsbooks on this page has the option for live betting that can be placed in play, during the live game. You will be able to access this portion of the site with any mobile device or your computer. The different bets and money lines will appear for you in a real-time apparatus designed to make placing those live-bets as easy as possible for you. Each website has their own banking suite that works with multiple international financial institutions in their deposits and payouts. When you are ready to make your first deposit and claim your welcome bonus you will see that the options for deposit and withdrawal vary by brand. The most popular banking methods used by our endorsed sites are Bitcoin, Visa and MasterCard, and money transfer methods using popular companies like MoneyGram and Western Union. Being an American you will not be able to request a payout using the major credit cards but there are a lot of other methods to choose from once you have decided to cash out. We always recommend that you look into the specifics regarding the cash outs as they come with processing times and fees associated with each of the different methods available to you. Bitcoin is by far the easiest form of currency to use as it is always instantly processing and never comes with any fees.